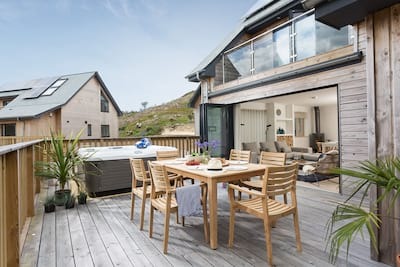 Hidden away amongst the white sand dunes of Hayle, Rockall welcomes friends and families to enjoy a taste of luxury Cornish life. 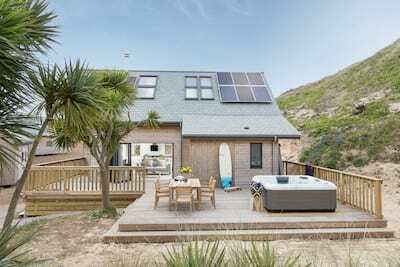 Offering three bedrooms, three bathrooms, a wonderful open plan social space and chunky wooden veranda with hot tub, Rockall has been flawlessly created and evokes a cool vintage Californian backdrop. The beaches of Hayle, Gwithian and Godrevy are moments away or visit the landmark coastal town of St Ives. From Winter weekends to Summer fun, Rockall will leave you rested and rejunvenated. 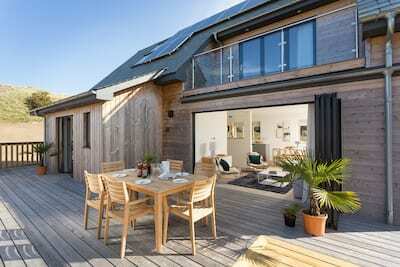 View the full gallery of luxury beach houses at Sandy Acres here. Step into the welcoming hallway offering ample storage and lead through to the open plan living, dining and kitchen space. Decked out in warm tan and cream tones, this marvellous mix of modern and retro bring a relaxing ambiance to your holiday scene. Think vintage surf and cool skateboard prints, 60's inspired furniture and stripped wood flooring. Days are spent coming and going from coastal adventures whilst evenings are gathered as a group in the comfort of the sofas. Dress the table to impress for celebratory suppers or simply lunch on the go. Whip up your holiday menu in the stylish kitchen as you join in the chit chat from the open plan layout. Bedroom three is set on the ground floor which also offers wider doors for wheelchair access. A convenient cloakroom completes the ground floor. Climb the central staircase to the light and bright first floor with two large bedrooms, the cool blues and antique furniture of the master bedroom and bedroom two with cosy bean bag filled nook for children to enjoy some downtime away from the adults. With three boutique bedrooms and three contemporary bathrooms, no guest need compromise on luxury! Slide back the bi-fold doors of the living space and enjoy an outside inside atmosphere. A beautiful wooden dining table and chairs become the meeting point for the daily check in as children explore the sand dunes and pop back for elevenses. Rockall offers a wooden ramp for wheelchair access with wider door frames for the ground floor bedroom. Hop in the hot tub come cloud or shine and soak away the stresses of everyday life, what better way to enjoy a holiday pamper. Hayle is fast becoming one of Cornwall's best kept secrets and perfectly located as the gateway to the West. Cool cafes open their doors, the Hayle Estuary teems with seabirds and colour and the golden sand beaches stretch on for miles. The nearest beach is Sandy Acres at Hayle accessed along the bumpy beach track on foot in approx 5-10 minutes or pack up the car and drive a short distance to Gwithian or Godrevy Beaches, each offering a superb sand, surf and cafe culture. The cosmopolitan town of St Ives is a short drive away and well worth a visit for it's unique picture postcard setting and collection of eateries and shops or explore the quieter coves of Mousehole, Porthcurno and Sennen during your time in the West of Cornwall. There is a wheelchair ramp to access the veranda. Limited head height with the Nook of bedroom 2. Lovely property in a lovely location. We had a super time. Beautifully clean and well presented.